On 24th of May, GAZ-SYSTEM and Energinet signed a tripartite co-financing agreement with the EU Innovation and Networks Executive Agency (INEA) for Baltic Pipe engineering works under the Connecting Europe Facility (CEF). The EU funding counts about €33,1 million and are meant to carry out preparatory studies and surveys as well as pre-construction activities for the Baltic Pipe Project. The signing of the co-financing contract implements the EU Member States' decision of 25 January 2018 on awarding financial assistance to the Baltic Pipe project under the EU Connecting Europe Facility (CEF). The financial support was granted in the 2017 CEF Energy competitive call to the project titled "Preparatory works for the Baltic Pipe Project up to obtainment of all necessary permission(s) in Poland and in Denmark" implemented by Polish and Danish Transmission System Operators - GAZ-SYSTEM and Energinet. The construction of this new pipeline is an EU Project of Common Interest (PCI) and parts of this project - analysis of economic feasibility and technical feasibility study and other preparatory studies - are co-financed by CEF Energy. The completion of these studies will prepare a solid basis for taking further crucial steps towards the Final Investment Decision (FID) to start the construction phase of the project. The pipeline is planned to become operational in October 2022. The Baltic Pipe Project is a strategic gas infrastructure project aimed at creating a new gas supply corridor in the European market. 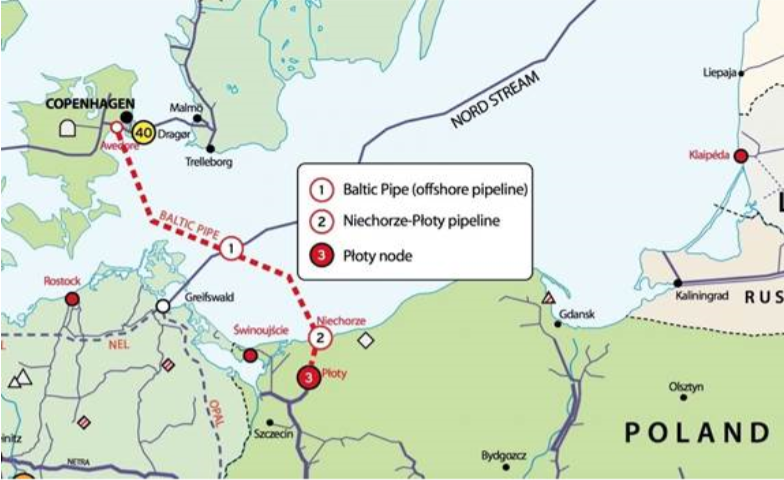 The Baltic Pipe Project will allow transport of gas from Norway to the Danish and Polish markets, as well as to end-users in the neighbouring countries. The main objectives of the Baltic Pipe Project encompass further enhancement of gas supplies diversification, natural gas market integration, price harmonisation and ensuring the security of gas supplies primarily to Poland and Denmark, as well as to Sweden, Central and Eastern Europe (CEE) and the Baltic Sea region.